Leaving Edinburgh took it's sweet time because of some roadworks, leading to a massive congestion. I did not visit Falkirk Wheel due to limited time: the detour would have increased the pure travel time to five hours, plus breaks. After having left Edinburgh the ETA had already climbed from 14:20 to 15:00. Since I had communicated an arrival time of 16:00 with my host that was still alright. This picture does a poor job of describing the road and for once I wish I had an action camera mounted on my bike or helmet. Moorish landscapes gave way to valleys with little rivers and steep cliff faces which gave way to lush forests all within 30 km. Riding this road while humming the theme transformed me and my bike: I was Bond. James Bond. Riding an Aston Martin DB5 in the Scotland opening shot in Skyfall (which was shot on that stretch of road). I will definitely ride this road again. In comparison the rest of the road was actually quite dull. 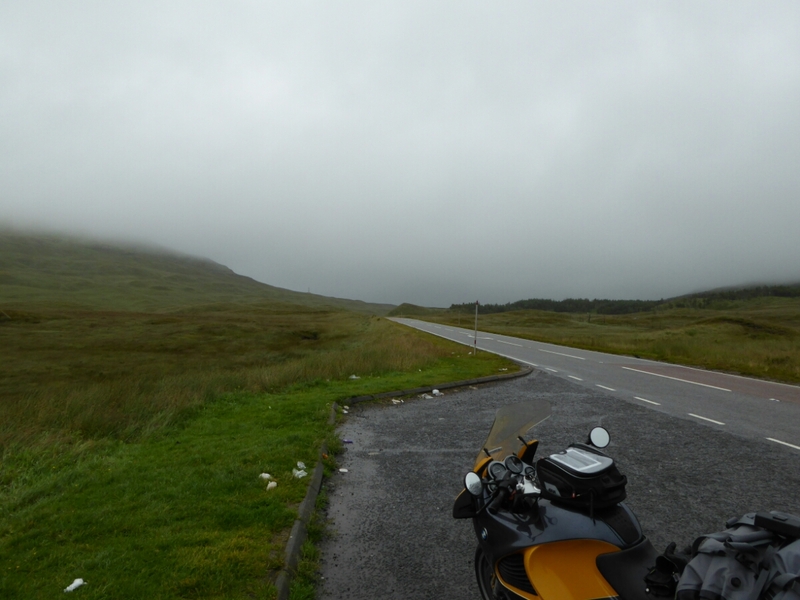 Riding through forests on roads that could have been at home if not for the Lochs right next to them. A problem was the traffic. There were quite a lot of busses and camper vans which were nearly impossible to overtake on the mostly winding roads. Combined with the overly optimistic average speed assumption of my satnav (what, you don't do 75 kph on average on a curvy road with a speed limit of 96kph?) this led to my eventual arrival at the apartment at 16:15. The whether forecast for tomorrow is mixed, but on Sunday it is supposed to be sunny most of the day. I will probably be making my trip to Skye then.